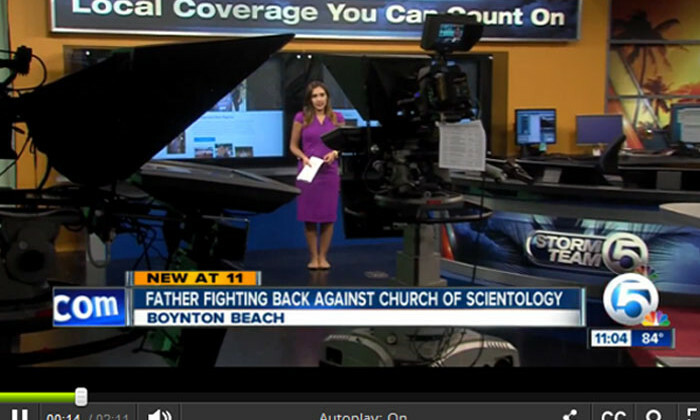 BOYNTON BEACH, Fla. – A Boynton Beach man says his family is being torn apart by the Church of Scientology, which he says has labeled him an enemy. “She just got married for the second time, we were in San Francisco, it was beautiful,” said Brian Sheen. When he gave his daughter away, he didn’t think it would be forever. “It’s been heartbreaking and the last three months I’ve been trying to figure out what do I do,” added Sheen. Sheen’s daughter is a Scientologist. He was shocked when he received a letter from the Church of Scientology two months after the wedding, declaring him a “suppressive” person and notifying him his only contact with Scientologists should be with the International Justice Chief. “They believe that I am actively seeking to suppress or damage them,” added Sheen, reading off the letter he says he received. “She didn’t know what was happening, she was very upset, she couldn’t believe it could possibly happen,” added Sheen. He filed a civil rights complaint with the state, hoping the church’s actions would be seen as a violation of his civil rights. “If she would talk to me everything she has would be taken from her because she would then get the same declaration and they wouldn’t be able to speak with her,” added Sheen. “I love you. Just know I always support you and we’ll somehow find a way to get together,” added Sheen. We reached out to Sheen’s daughter, but have not received a call back. Public Affairs Direction Pat Harney issued this statement: “The Church of Scientology does not comment on the private family matters of our parishioners. For accurate information about our beliefs and practices, please see the frequently asked questions at www.scientology.org/faq.html“.